There are two ways to collect field Samples. 1.Collecting using the Field Sample tab. 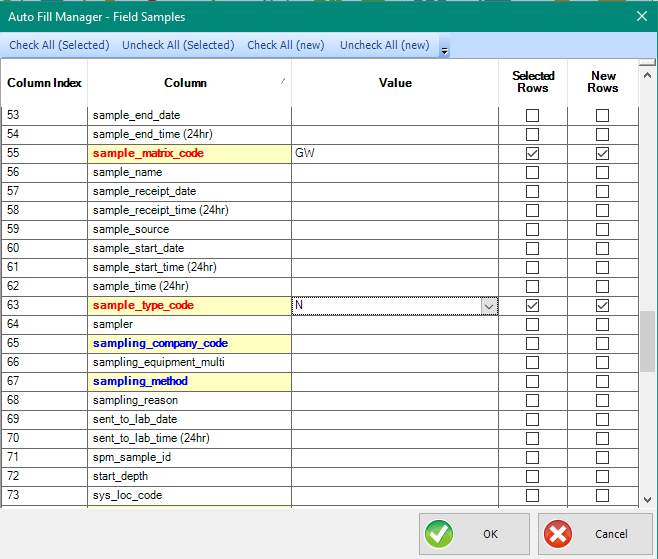 Go to Field Sample Tab for more information about features within this tab. 2.Using the GW Form (FieldSampleForm) Go to FieldSampleForm for more information about collecting field samples. 1. Click the Field Samples tab. 2. Select the Auto Fill button on the toolbar above the data section tabs to open the Auto Fill Manager. 3. Designate values as desired to auto-populate for any currently selected row and all new rows. 4. Confirm that the Selected Rows and/or New Rows check box(s) are correct. 6. 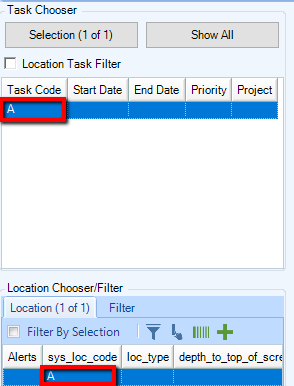 On the left pane, select a Task from the Task Chooser, and a Location from the Location Chooser. 7.On the Field Samples tab, click the New button. A new sample associated with the selected task and location will be added to the Field Samples section. For all new records, the default values set in the Auto Fill interface will populate automatically. 8.Enter all of the required and supplemental information for the sample. Note: The SYS_SAMPLE_CDOE field will populate automatically when SAMPLE_DATE, SAMPLE_MATRIX_CODE, SAMPLE_TYPE_CODE have been entered. 9.Click Save frequently to save the EDD while editing and adding data. 10.Highlight the next location in the Location Chooser, and repeat steps 7-9. Continue until all field samples have been collected. For information regarding Field Results collection, such as Method Analyte Groups (MAGs), go to Field Results.